GOP legislators, who control the budget process, oppose Whitmer’s gas-tax increase and say they are still working to find consensus in their own ranks over how they want to fund road repairs. And some legislators are not in full agreement with Whitmer over the amount of new revenue her administration says is needed for roads.The early clashes over roads between Whitmer and Republican legislative leaders are not insurmountable, according to Lansing political insiders, who say that despite some public posturing, both sides appear willing to compromise. That will be important if they are to avoid a budget showdown that lasts into the fall, leaving Michigan without a final spending plan when the new fiscal year starts in October — the kind of impasse that led to brief government shutdowns in the 2000s during Michigan’s last era of divided government, under then-Democratic Gov. Jennifer Granholm. Right now, Whitmer has the upper hand in negotiations because hers is the only road-funding proposal on the table, and she’s using her statewide bullhorn to control the roads narrative, said John Sellek, a Republican strategist and CEO of Harbor Strategic Public Affairs. Whitmer has presented her budget to groups in cities across the state since she rolled out her proposal in early March, including in Eaton County and Traverse City this week. That poses a challenge for Republicans in the Legislature, since they didn’t have their own proposals right out of the gate, Sellek said. Even though it’s not unreasonable to expect it might take awhile to develop a proposal with so many new lawmakers taking office in January due to term limits, he added, voters will want to see results. A compromise seems possible because no one disagrees that there’s a road-funding problem, said John Cherry, a Democratic former state lawmaker and Granholm’s lieutenant governor. That doesn’t mean it will be easy. How Whitmer and GOP legislative leaders settle on a deal could send some of the strongest signals yet in this new period of split-party control about how they will be able to jointly solve some of Michigan’s most pressing problems. “It’s a tough issue to resolve,” said Paul Hillegonds, a former Republican state House speaker and state representative from 1979 to 1996. “I think it becomes a defining issue for how the governor and the legislative leaders and their caucuses are going to work together over the next two years,” said Hillegonds, himself a veteran of divided government, having shared the speaker role with Democrat Curtis Hertel Sr. in the 1990s. One starting point they have in common: Whitmer and lawmakers from both parties agree that improving Michigan’s roads are a top priority, and more revenue is needed. But they quickly diverge from there. 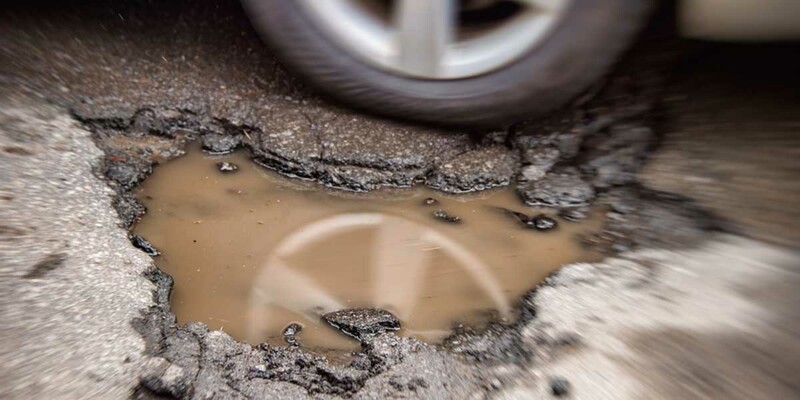 Whitmer sees the 45-cent gas tax increase, spread out over a year, as the best way Michigan can quickly stop roads from deteriorating more than they already are. Republicans disagree. Her proposal would generate $2.5 billion in new revenue that would prioritize the most heavily traveled roads, with the goal of getting 90 percent of state freeways and highways into good and fair condition by 2029. State senators, meanwhile, say they intend to submit a budget to Whitmer in early June that will include more funding for roads than today, possibly by redirecting existing spending, but will not include a longer-term funding solution, Senate Majority Leader Mike Shirkey, R-Clarklake, told reporters Thursday. That longer-term proposal also is expected to be ready by the summer, Shirkey said. He said he wants to avoid delaying work on other parts of the state budget by sending Whitmer a budget with more road funding for 2020, while talks continue on broader road-funding policy bills that could have fiscal implications beyond next year. Whitmer countered that tackling road funding separately from the rest of the budget would not achieve her goal of funding several high-priority programs at once. How much new revenue will be raised remains another open question. Whitmer and legislative leaders from both parties say they continue to talk privately in weekly meetings. Shirkey said he disagrees with Whitmer’s assertion that Michigan needs another $2.5 billion per year in road funding, on top of current spending levels. Instead, Shirkey said an anticipated $2 billion-plus in new road funding should include the $1.2 billion previously adopted in 2015. That would mean finding another $1 billion or $1.2 billion in additional revenue, he said. Chatfield, R-Levering, would not divulge details of what House Republicans might propose, other than to say it would contain more funding for roads and that new funding would not come from Whitmer’s proposed 45-cent gas tax increase. He also would not say when the House plan will be publicly unveiled. “Our goal is to ensure that a responsible budget is done before Oct. 1, whatever time that may be,” Chatfield said. Chatfield has been on record saying the state’s road-funding problem is rooted in the fact that drivers pay Michigan’s 6 percent sales tax when they fill their gas tanks, but the sales tax revenue goes to schools instead of roads. What does a compromise look like? A starting point for a deal is for legislative leaders and Whitmer to agree up front on the scope of the state’s infrastructure needs, the amount of money it will take to address them, and how quickly they need to be addressed, Hillegonds said. Hillegonds said he supports Whitmer’s proposal for the amount of revenue it generates through the gas tax, but said he would prefer to see the increase phased in over a longer period of time. Hers would be a difficult proposal to bring to the Republican House caucus, he said, but it’s also an issue that would require bipartisan votes. Whitmer has put Republicans in a tough spot, agreed TJ Bucholz, a Democratic strategist and president of Vanguard Public Affairs in Lansing. Bucholz said he doesn’t expect a budget any earlier than late summer, in contrast to legislators’ practice of finishing budgets before they leave for summer recess during Republican Gov. Rick Snyder’s two-term tenure. Setting the calendar is “one of the few controls that Republicans have here at the moment,” Bucholz said. The Michigan Infrastructure & Transportation Association, which represents road builders in the state, said it is willing to support a variety of ideas so long as they raise enough money to adequately fix the roads and that new revenue is constitutionally protected, said Mike Nystrom, its executive vice president. Redirecting existing spending to roads is not protected the same way as the gas tax, he added. Whitmer’s plan raises enough money to solve the roads issue, Nystrom said, while Chatfield also is correct in wanting to tackle the sales tax paid on gasoline. One idea the road-builders group is considering pushing is to phase in a 45-cent gas tax increase over a longer period of time, while simultaneously phasing out the sales tax at the gas pump, Nystrom said. That would give policymakers time to make up the revenue that would be cut to the state’s public schools fund by ending the sales tax on gasoline. Whitmer’s likely to agree to a compromise, since a deal on roads would mean a victory on her signature campaign issue, regardless of whether it ultimately includes a 45-cent gas tax increase, Sellek said. But don’t expect her to make the first move. It’s up to Shirkey and Chatfield to deliver an alternative plan for which they can deliver a majority of votes in the Legislature, he said. The people of Michigan should be told WHY older roads like I-75 and the Davison lasted over 50 years and I 69 less then 20???????? Our roads have been in decline for a very long time.....seems as if every time they fix them, the faster they fall apart....when will they use material that lasts longer than a month?? I realize that they want to keep road crews busy but there's enough work to last about 10 years right now!!! FIX THE DAMN ROADS and use material that lasts longer than a month!!!!!!!! You are not certain anyone lost a seat for voting in a gas tax? Contact Daniella Garcia. So...why have gasoline prices increased by .60 cents a gallon since the governor released her funding plan ? I think we have a twofold problem. Lowering the load limits on commercial vehicles would go a long way toward limiting damages to our roads. We have one of, if not the highest, load limits in the nation. I think also that hiring roadwork out to the lowest bidder guarantees that only the minimum standards for repair will be met and often enough the repairs are substandard so the roads continue to crumble and need repair more often. If the standards were raised, yes roads would be more expensive, but they would last much longer particularly if the load limits were more in line with other states. You get what you pay for. 3rd party or government inspectors monitoring the whole process to make sure it's done as spected (by the government unit involved). It isn't just the roads. There are no workable programs to help those who are low income to repair or update their homes. The rules are so unrealistic that the Commissioner in Midland Country told me on the phone that Midland no long does that because the rules they have make it ridiculous and even those who actually would benefit from this sort of program are very few. Too many rules ruin almost everything. Everyone is watching and waiting for our law makers to reach some sort of compromise with our Governor over the roads while every day our system of roads continue to slip into an abyss of continuing degradation. Gretchen said she'd fix the 'damn' roads knowing full well she'd have to battle the legislature to pass a tax increase and that takes time as our legislators move at the speed of government. However, the four seasons continue to move on daily and soon construction will be ending for the year and AGAIN we won't have funding, let alone a plan to fix the roads. That said, one thing Gretchen has total responsibility for is the specifications of those new roads once we all pony up after the legislature finishes carving a hog to pay for them. MDOT needs to overhaul how roads are made and design and build them with the intent of lasting 50 years. Gretchen owns MDOT. You're gonna get the money one way or another. Change the road building specifications and build roads to last longer than 10 winters. The old adage rings true about how we build roads... if you keep doing what you're doing, you'll keep getting what you're getting. "Right now, Whitmer has the upper hand in negotiations because hers is the only road-funding proposal on the table, and she’s using her statewide bullhorn to control the roads narrative, said John Sellek, a Republican strategist and CEO of Harbor Strategic Public Affairs." No wonder their candidate lost. Whitmer had to backpedal on the whopper of a lie that she told to voters last year during the debates in order win over the rubes prior to November. Now, she's trying her best to retain any credibility she had in the first place (which is still very minuscule). Just let her keep on digging a bigger hole for herself.